Beer and bacon lovers are going to like this news - Slater's 50/50 restaurants, infamous for their bacon-centric food and the 50% beef, 50% bacon patties in their burgers, have released a new loyalty program that favors the beer aficionados. This 50/50 VIP Club grants you an exclusive-looking membership card that opens up a long list of perks including Burger of the Month preview tastings, promotions, discounts, and events; however, the greatest perk that pays for itself in our minds is getting one beer a day without additional costs as a club member (no rollovers). That's neat. Though it is only $30/month right now for members to sign up, we haven't bitten the bullet yet to get ourselves an exclusive card. 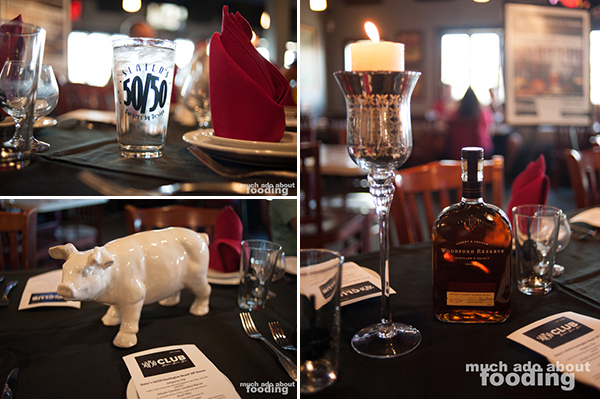 From an invitation, we did join the inaugural club members on their first ever 50/50 Club VIP dinner which was hosted as a five-course Bourbon paired dinner. The dinner was actually also open to other non-members to attend for a fee but membership wielders got to partake in the dinner without charge. 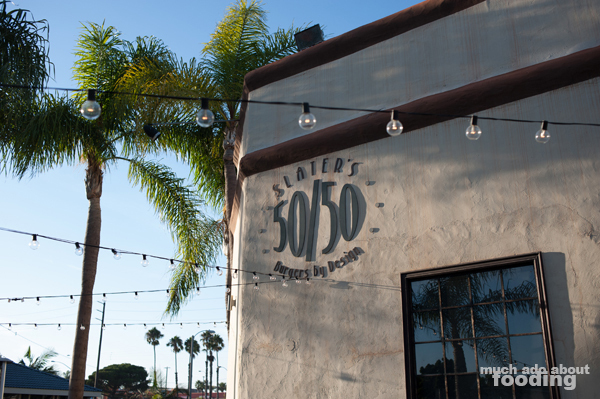 The first dinner at Slater's 50/50 of Huntington Beach was hosted on September 23rd, and the menu looked decadent. I wouldn't have classified this particular dinner as a pairing style, however, as there was just a full bottle on the table of Woodford Reserve and food shuffled out aplenty rather than being paired per dish. Regardless, what a memorable dinner albeit indulgent. For the most part, we are cognizant of what we eat and what it's made of but going to Slater's 50/50 comes with certain expectations. 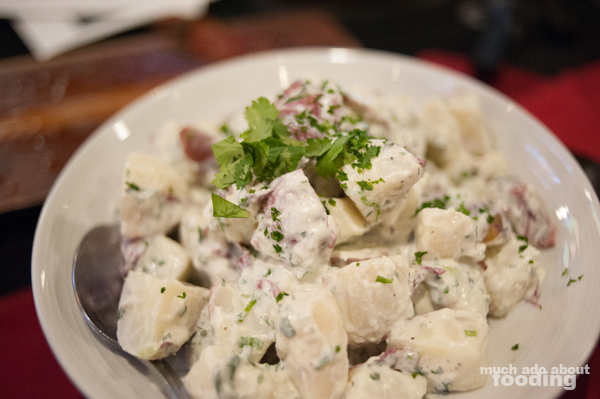 You will have to accept that the dishes will be bombastic. 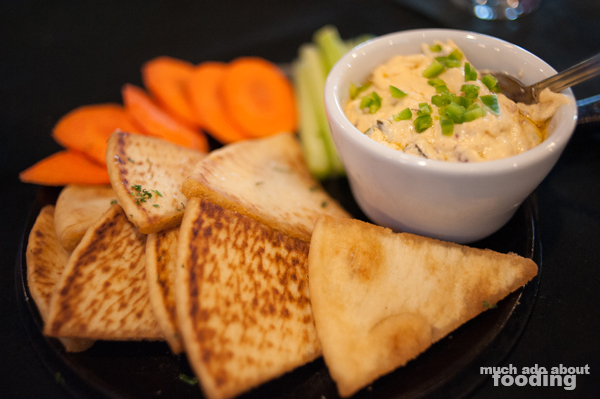 The tables began with a bowl of the Jalapeno Dip (spicy cream cheese dip with fresh jalapenos, pita chips, and fresh vegetables) which had such a pleasant kick to them without being unbearable. The fresh vegetables made us feel a little better from the start but let's just say, the following courses were in line with the indulgence the restaurant encourages. As this was the first dinner of its kind for the 50/50 VIP Club members, we weren't sure if the chef's presentations would be part of ongoing perks but it was certainly a fantastic way to add more definition behind the dishes. 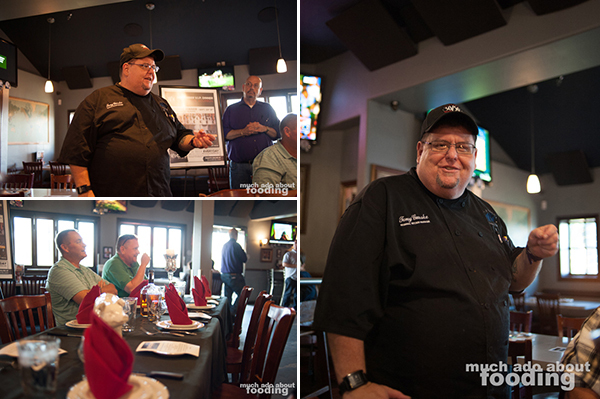 With each course that was served, out came the chef to talk about why he decided to prepare the dishes as certain way. 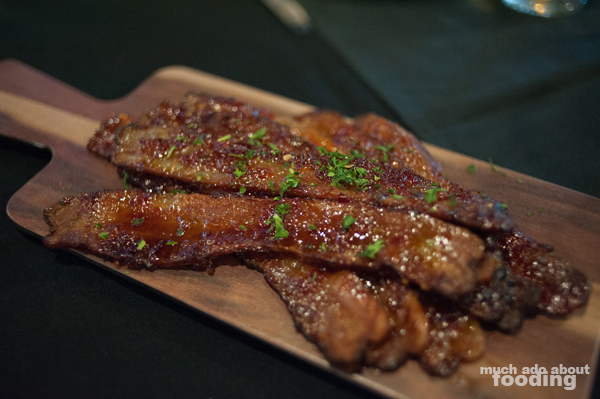 We all drooled a little bit when thick-cut slabs of Maple Sambal Candied Bacon arrived, glistening in their sweet-salty-spicy goodness. I'm not sure how or if these will appear on future menus but if you see them, get them. Not pictured is the impressive whole hunks of Beef Ribs, cooked to a smoky perfection with a tender juiciness that had us all clamoring for more. 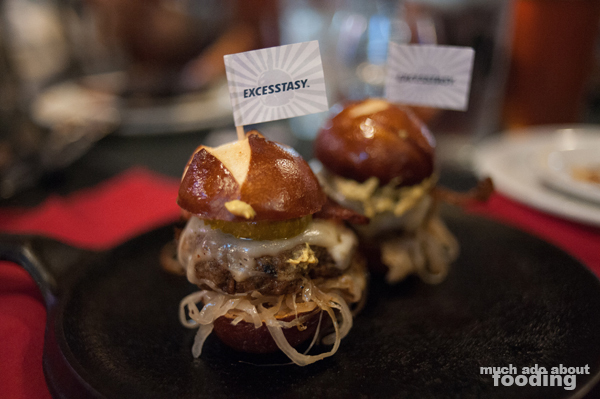 With the VIP dinner and membership overall, members get to preview the upcoming Burger of the Month, and for October, Slater's 50/50 was aptly showcasing a Bratwurst Burger (sweet bourbon apple sauerkraut, pickles, brown mustard, Swiss, and bacon on a pretzel bun) which we all had in miniature slider form. The mixture of ingredients was a fine mix of several different textures and tastes but I found it just a tad too salty, likely from the actual brat patty. 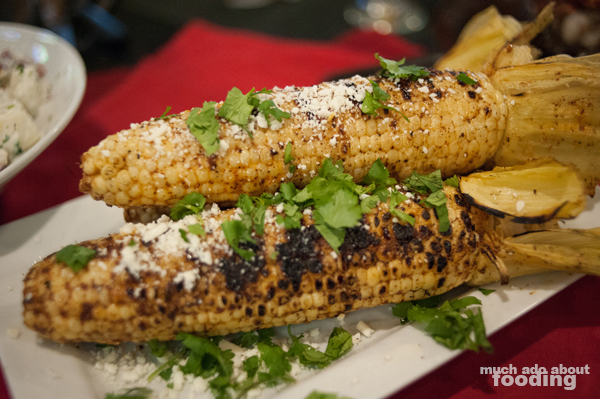 To mitigate that, we also had heaping sides of their Potato Salad and Mexico City Corn on the Cob, both satisfyingly filling as well and packed with more than enough flavor. Now to think that that was the end of the meal would be silly - after all, Slater's 50/50 is also known for putting bacon even in their desserts. 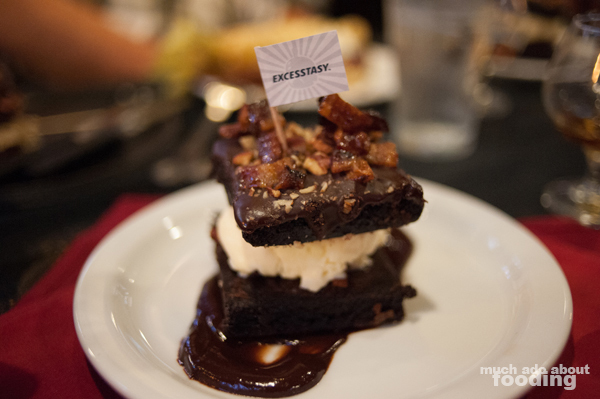 Every guest ended up with a full-sized, intimidatingly large Bacon Brownie Ice Cream Sandwich (candied bacon, chocolate ganache, vanilla bean ice cream, and fudgey chocolate brownie) which towered and could easily sate any sweet tooth. The saltiness from the bacon lent a nice twist on many places' tendency to place sea salt atop chocolate, and the chocolate was richly thick. I could barely make it through the first brownie after being so full! All in all, the dinner itself is worth more than $30 so how could a $30/month membership not be tempting to you? Toss in a few daily brewskis and you have yourself a winning deal!